Ever since LL announced they were actively working on integrating Oculus Rift into Second Life, there has been a lot of upbeat blogging and speculation as to what it will do / mean for the platform. Reading some of the more enthusiastic posts on the subject, it’s hard not to escape the feeling that we’re apparently standing on the edge of a new age in virtual worlds interaction, and that Oculus Rift is going to bring new depth, new meaning (and new users) to Second Life. Not all agree with the upbeat messages surrounding the headset and SL. Coinciding with the appearance of a photo showing the Lab’s CEO trying-out the headset, Mona Eberhardt and Will Burns each blogged on the Oculus Rift and some of the factors which could limit its wider use with SL. Both of them raise some valid points, and while I don’t agree with all their arguments, they do present food for thought. Oculus Rift is a first-person experience, and this could immediately limit its appeal. The problem here is not so much interacting with the UI or in-world objects – the UI can be updated to handle such shortfalls; some TPVs already allow far greater access to the UI view and to in-world objects than the official viewer when using the first-person (aka Mouselook). Firestorm, for example, presents users with the toolbar buttons in Mouselook which can then be used to display and interact with various UI elements, and it also allows right-click/menu interactions with in-world objects. 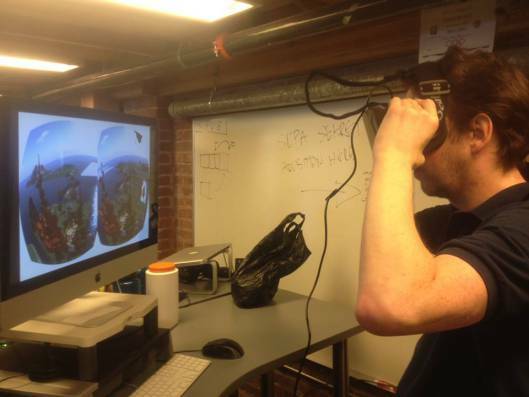 Ergo, it’s not exactly that hard to re-work things to make them more accessible when using something like Oculus Rift. Similarly, the upcoming updated / new experience tools could also provide the means for better interactions with in-world objects such as teleport portals. Rather, the problem is that most people seem to intrinsically prefer the third-person view, with the greater freedom (e.g. camera movement, etc.) it presents for the vast majority of their in-world interactions and experiences. Coupled with the price tag for the headset (something I’ll return to in a moment), this could possibly count against the Oculus Rift in terms of general use. Then, as Mona and Will point out, there is the problem that the headset isolates the wearer from the primary means they have of interacting with other people: the keyboard. While the conversations floater can easily be displayed (CTRL-H), it still leaves the problem of actually being able to see the keyboard in order to type accurately. This leaves those wanting to use Oculus Rift either needing to become very proficient touch-typists, or they’re going to have to settle for using voice. Will Burns points to issues of headsets and open microphones as being a problem when it comes to voice. but I tend to disagree with him. For one thing, it’s not as if a headset / microphone combination can’t be worn with the Oculus Rift. More particularly, and from the in-world meetings held in voice I routinely attend, people actually do leave their microphones open, as the barking dogs, ringing ‘phones and the clicks of lighters being flicked in the background tend to demonstrate. No, the problem is actually more basic than that. It’s this: since its introduction in 2007, voice tends to have been avoided by what seems to be the vast majority of SL users. Many simply will not use it, period. So if voice is seen as the means for person/person interactions when using Oculus Rift, then it is quite likely to further marginalize take-up with the headset, no matter what the promise of Exciting New Things it might bring. In his piece, Will also points to the limitation of the headset when trying to perform tasks such as building. Such critiques might appear to be unjustly harsh and leave people saying, “Well yes, but Oculus Rift isn’t designed to be used for everything!“. However, while such a reply is true, it actually underlines Will’s central point: that the headset is liable have niche applications in Second Life which could further limit its appeal among the wider user base. On July 16th, NASA’s Mars Science Laboratory rover Curiosity passed the one kilometre mark (0.62 miles) on its travels around Gale Crater. 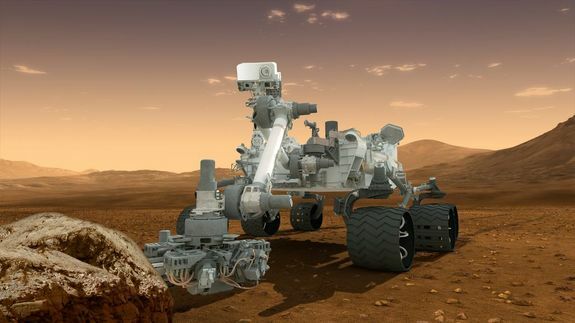 The milestone came eleven months after the one-tonne rover arrived on the surface of Mars on August 5th 2012. Since that time, Curiosity has achieved a lot; it has travelled across several terrain types, it has studied the Martian atmosphere and meteorology and probed the ground underneath it for evidence of water. It has taken samples from the surface of Mars and drilled into rocks. It has analysed samples and returned a huge amount of data to Earth, including thousands of colour, black and white and high-resolution images. It has viewed its surrounding in 3D and – most intriguing of all – it has discovered very convincing evidence that Mars was more than likely once an abode suitable for the evolution of basic life. Coincidentally, July 17th 2013 marked the half-way point for the rover’s prime mission of one Martian year (687 day or 1.88 Earth years). As the rover’s power system has a potential operating life of fourteen years, it is more than certain that, barring any accidents or major systems failure in the interim, operations will be extended well beyond the prime mission time frame. In this, Curiosity will not be alone; half a world away, NASA’s rarely mentioned Opportunity rover is fast approaching the tenth anniversary of what was originally a 90 day mission. As mentioned above, Curiosity has been studying the Martian atmosphere using the Sample Analysis at Mars (SAM) suite of instruments. SAM has more recently been involved in analysing rock and soil samples collected by the rover’s scoop and drilling system, so it is easy to forget that it can also “sniff” and analyse Martian air, which it did for the very first time right back at the start of the mission. Since then, SAM has continued to periodically sample the Martian atmosphere, and it has already helped in further understanding the dynamics of the atmosphere and how it may have been lost over time. SAM is able to measure the abundances of different gases and different isotopes in the Martian atmosphere. Isotopes are variants of the same chemical element with different atomic weights due to having different numbers of neutrons. In the first set of tests carried out, SAM compared the stable isotope argon-36 with its heavier cousin, argon-38. Since then, SAM has carried out a series of comparative tests on a range of isotope drawn from the Martian atmosphere, including carbon-12 and carbon-13 and both oxygen and hydrogen isotopes. These tests, carried out using two different instruments within SAM – the mass spectrometer and tuneable laser spectrometer – during the first 16 weeks of the mission, measured virtually identical ratios of carbon-13 to carbon-12, with the ratios again pointing to the lighter isotopes having “bled off” into space from the upper portions of Mars’ atmosphere, rather than a process of the lower atmosphere interacting with the ground. The rate at which Mars is currently losing its atmosphere cannot be measured by Curiosity or any of the vehicles currently operating in orbit around Mars. This will be the work of the Mars Atmosphere and Volatile Evolution (MAVEN) mission, which is due to be launched in November 2013. Gullies on Mars: Water or Dry Ice? While it is accepted that Mars’ atmosphere was once dense enough to support liquid water – Curiosity itself has found unmistakable evidence for free-flowing water to have once been present in the crater – evidence has also put forward to suggest that some features imaged on Mars and associated with possible water action may have been the result of another process entirely, as explained in this interesting NASA video. New capabilities to the materials system to better handle texture requests. Magnum and LeTigre will remain SSA enabled and both receive the updates deployed to the Main channel. A fix for BUG-3307 “(llApplyImpulse called from attachment does not work on avatar if script is reset or started when attached”). 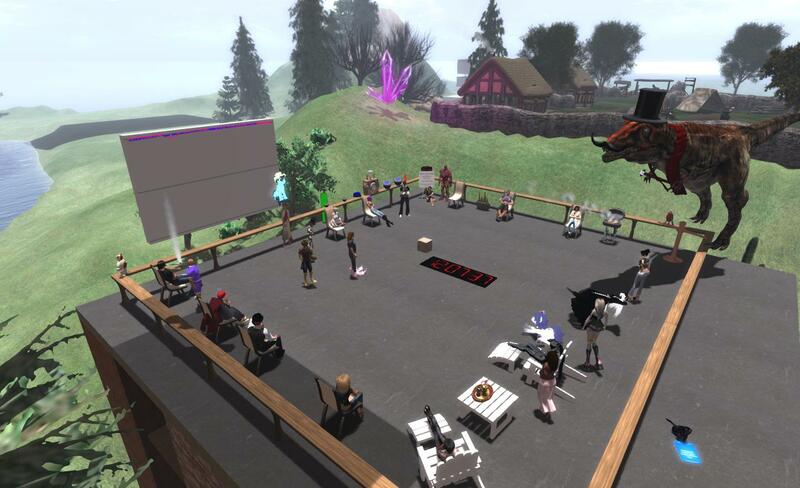 Doyouthinkhesaurus – Baker Linden (far right), in his new avatar look, literally towers over the start of the Simulator UG meeting on Tuesday July 30th. I provided an update on some of the more serious issues the Lab has been addressing with SSA in part 2 of my week 30 report (see the link in the paragraph above). Since then I’ve been poked about additional advice the Firestorm team have put together for those experiencing issues, including SUN-98,and I’m providing the relevant information here. If an item shows-up fully or partially grey, that is the corrupted asset. Replacing it should allow everything to bake and render correctly. The Firestorm article also includes some Firestorm-specific actions for problems, and is a work-in-progress, so you can refer to it via the link above for further advice. Last week I posted a piece which, among other things, commented on recent issues I’ve had accessing WordPress.com to admin this blog (upload new posts, edit / update existing posts, reply to comments, etc.) and even view other people’s WordPress.com blogs. I wasn’t alone in experiencing the problem, which has lasted well over a week and a half. According to WordPress, some of their servers had ended up on a block list at IWF as a result of a blog being put up which was in violation of their ToS (and which was quickly removed by WP). As a number of UK ISPs picked-up on the IWF notification, they blocked access to the “offending” servers, and things are now only just being untangled. Things still aren’t quite back to normal, but my own connectivity with my blog has greatly improved in the last 24 hours. So, this being the case, I decided to start catching up (again!) on some of my destination blogging. 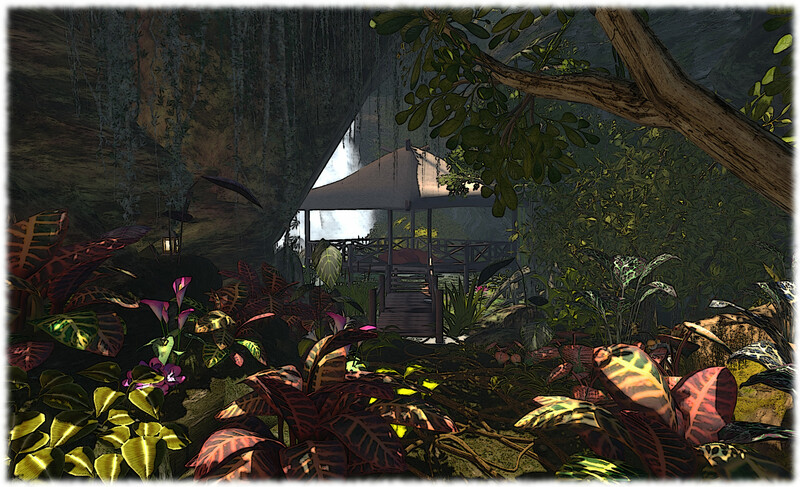 And where better to start than at the Garden of Eden, located on the island region of Golden Rose? The work of digital artist Liara Okiddo, Garden of Eden is beautiful proof that you don’t necessarily need a full region to produce something which is both stunning and immersive. Occupying a 8192 sqm parcel, this is a place which really has to be seen to be appreciated. 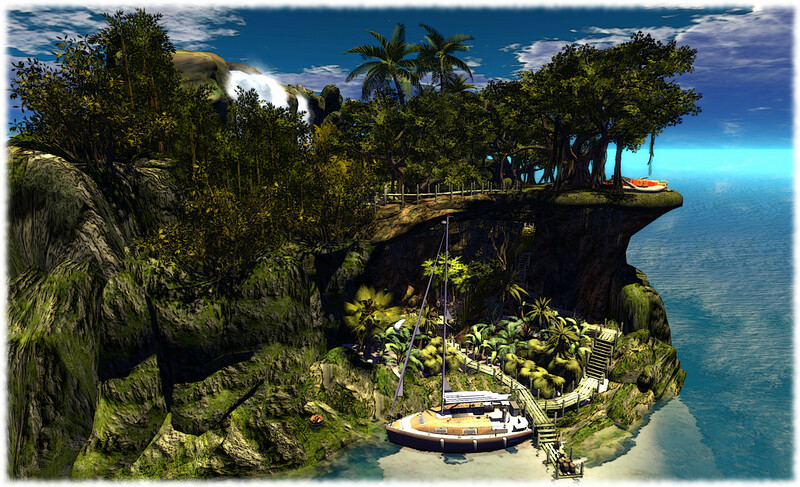 The SLurl I’m providing will land you on a wooden walkway to one side of the parcel, with a sail boat moored alongside. Right away there are nice touches: a roll-on-roll off flight bag sits on the quay, as if put there by someone who has either just arrived on the boat, or is getting ready to sail away. Overhead, parakeets fly idly by, and butterflies flutter busily further inland. Where you go from here is up to you – wooden walkways both climb up the rocks which shape the parcel into a shaded tropical gorge, and lead inland. However, I do recommend you go inland first. If you do, you’ll find yourself being led past a broad, shallow pool and deeper between the rocks until eventually you’ll come to a small tiki hut, tall waterfalls as a backdrop. Here you can sit a while on your own or with a friend and simply contemplate whatever enters your mind, or you can watch the hummingbirds busy in their daily chores. 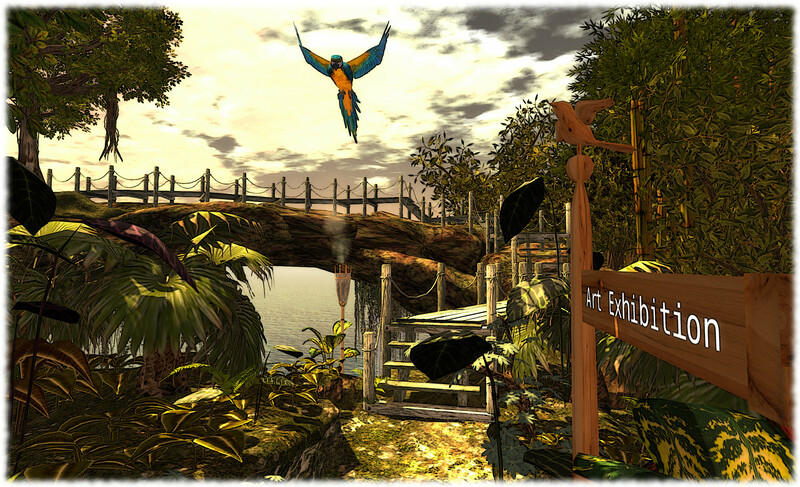 When you’re ready, wander back along the walkway and perhaps admire the butterflies and parakeets before you start your climb up to the rocks above. The wooden stairs and roped walks (Alex Baders’ very familiar pieces), will take you up and around the shallow pool and bring you to a junction. Turn left, and you’ll pass over a great stone arch with a view out over the sea, the sail boat below you, to another resting place. Turn right at the junction, and the path will take you to the exhibition space. Here is another very unique environment, designed to put the visitor at ease. There are book cases with books scattered on the floor, a dining table with a bottle of wine, glasses and candles. Pictures are displayed on easels, and a glass roof overhead lets in plenty of light and allow one a view of the lanterns floating above it. Once again, the attention to detail is wonderful, and it’s worth camming around / exploring a little to make sure you catch all of the little touches. To say this is a truly fabulous build really doesn’t do it justice. The use of space, the overall design and layout, the amount which has been packed into the parcel, the attention to detail – all of these aspects are brought together to present a very immersive, creative place to visit and enjoy. Anyone who is limited space-wise, and is looking to see what might be achieved with a little planning, a careful eye and a dash of imagination, whether it be to establish a store, gallery or their home, should drop by Garden of Eden. It’s sure to impress and get one’s one creative juices flowing. For those who simply like exploring, have an eye for art and enjoy photography, this is a place definitely not to be missed. Thoroughly recommended. Only the first quarter will be discounted; the rest of the year will be charged at the full Quarterly membership rate. 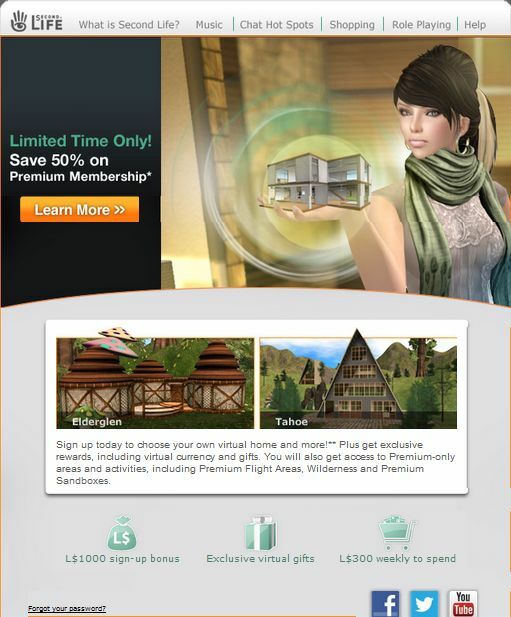 The offer will be running until 20:00 SLT (PST) on Sunday 11th August, 2013, and those wishing to take advantage of it can do so via the sign-up page. It’s likely the offer will draw upset from some quarters, with people pointing to the Lab “failing” to address issues of high tier. Whether such complaints are valid is actually debatable; when it comes to tier, the Lab is very much between a rock and a hard place insofar as tier cuts are concerned, as any significant reduction in tier could actually hurt their revenue stream far more rapidly than attempting to weather the storm of declining in private region numbers (and perhaps trying to deal with matters through other means). That said, there is a finger to be pointed at the Lab where Premium membership and land use is concerned, and that’s in regard to Linden Homes. 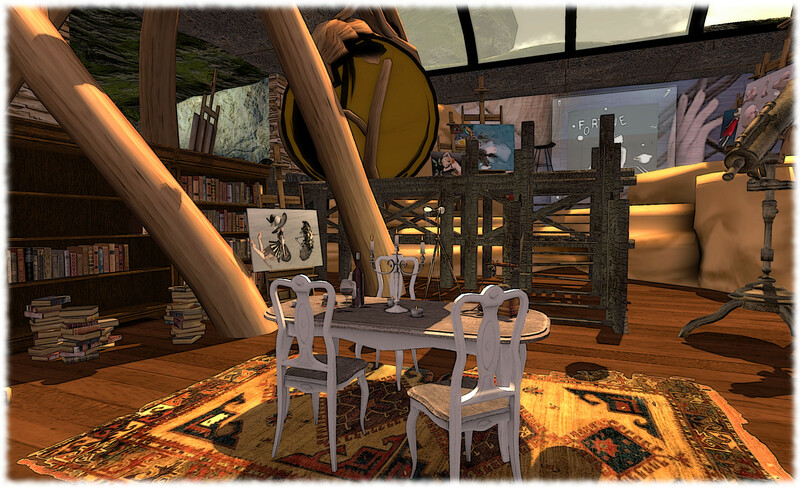 These were originally intended as providing a means to “get people started” on the road of having a house and land in Second Life. However, this has never been the case. There are no time-limits on Linden Home occupation, no incentives to encourage people to move on elsewhere, etc. 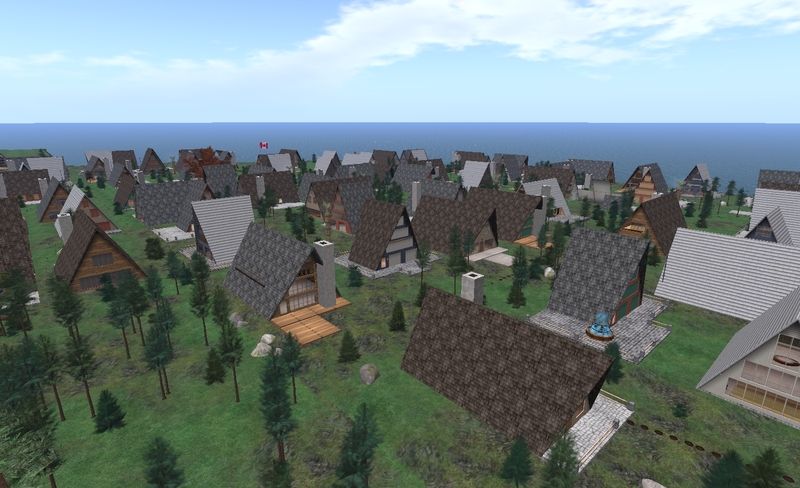 So people tend to stay, and the Linden Home regions grow, quite possible to the detriment of the land market as a whole – and I actually speak as a guilty party; I have a Linden Home and reduced all other land holdings to zero last year. The problem here is what to do. The fact is that Linden Homes are one of the “better” perks of Premium membership, their age and (in some estate cases) their so-called “slum” looks notwithstanding. If they are taken away, or if people’s use of them is limited, it could lessen the value in having people go Premium. Plus, even if the time people can have a Linden Home is limited, it doesn’t automatically mean that once that time is up, they will simply move elsewhere and rent land; they might simply opt to go without. Incentives are needed, and this again introduces problems: what should the incentives be, how should they be directed, and who should be involved? Some kind of co-operative venture between the Lab and rental estates might be possible; but again, which estates? And how would it be managed without the Lab being accused of “playing favourites” or damaging the market for the smaller rental operations or without the whole thing becoming too complicated to be easily managed by estates and / or the Lab? Linden Homes: hurting more than helping the land market? Might I suggest that if the Premium Accounts were instead treated as Professional Accounts, changing the focus from casual consumer to producer, then the Gaming Toolbox options for experience creation would be an excellent (and genuinely new) Added Value to the Professional Account holder. Since Premium/Professional Accounts require some sort of identification, this makes the Professional Account holder directly accountable for their actions using the professional toolbox systems. The problem here is that not all current Premium members are content creators. So what happens to them if the focus is to “rebrand” Premium accounts as “Professional” rather than to introduce a new “Professional” membership category? That said, the introduction of such a “Professional” membership package, with access to a unique set of tools and capabilities, in addition to a re-vamp of the Premium membership package would appear to have merit on a number of fronts (even if it would be liable to generate its own controversy). There are doubtless dozens of ideas which could be put forward on the subject of Premium accounts (and the future of Linden Homes). Whether the Lab would consider any of them, no matter how workable, is another matter. For now, however, the promotional offer is open. If you’re interested, I offered some thoughts on the matter a year ago, and which probably still holds true today and might be worth reading before making the jump.